Automated Storage Australia (ASA) has introduced proven automated storage and retrieval systems into the Australian market. 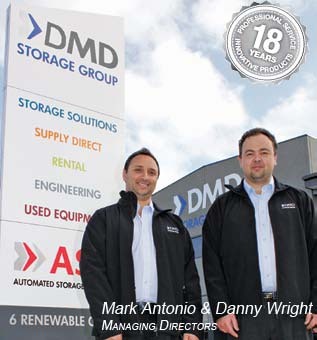 Automated Storage Australia (part of the DMD Storage Group) offer 18 years experience in storage solutions. This enables us to understand your requirements and ensure you receive a professional service driven to exceed your expectations. We can accommodate lift modules for small parts from Automotive to Health Care Industries. Large industrial systems for rolls, print cylinders, garments, long bar storage, sheet metal, fabric rolls and filing for document archiving. There are many more applications all of which can be custom designed to suit your exact needs. The major benefits of ASA Systems are scalability, high-density storage (space savings), ergonomics, increased picking productivity, accuracy and security of inventory. ASA can provide space savings ranging from 65 to 85 % over the use of conventional shelving or even drawer storage products. Our highly experienced and skilled technical experts will analyse your unique requirements and design a system allowing for current and future needs.